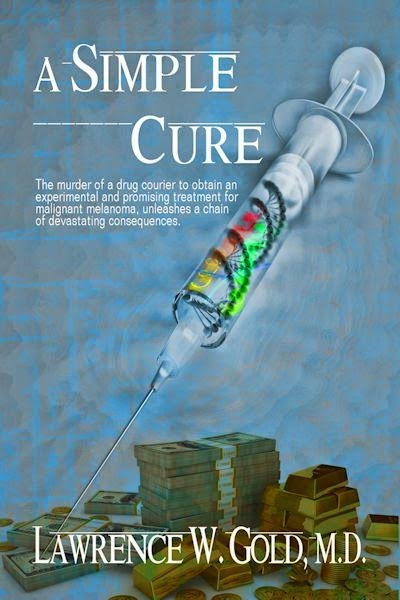 Today we are interviewing Lawrence W. Gold, M.D., author of the medical thriller A Simple Cure. I’m a retired physician and long distance sailor. I’m the author of 13 novels, and one non-fiction book. When Terri Powell’s husband dies from malignant melanoma, she devotes her life to its cure. A ruthless drug company stands in her way. How did your background as a physician influence your writing? Medical fiction at its best is dramatic without being campy, exciting without being unrealistic, and educational without being pedantic and laden with jargon. If you enjoy medical fiction that delivers the goods without insulting your intelligence, try the Brier Hospital Series novels and the other novels by Lawrence W. Gold, M.D. Readers are responding to A Simple Cure, saying that it’s unlike any thriller they have read. What is it about this book that so profoundly affects readers? An innocent looking dark spot or mole could, in fact, be a dangerous malignant melanoma. Anyone who enjoys medical fiction. Two characters in my novel, No Cure for Murder, Drs. Jacob and Lola Weizman, 88 and 84 respectively. They are holocaust survivors who take the fear out of aging. It’s a win/win for writers and readers. My writing is improving over time. I hope that continues. It would be nice to have more recognition for my work. Line editing. I’m no good at it. The computer and the Internet are gifts to writers.